Just Keep Sweating: Happy Fitness Friday! For the first time in a long time the scale is moving down! I started the Tone It Up diet plan on Monday and have already lost 3 pounds, it is not a *new* number (one pound away from that) but I am hoping to keep them off and loose a few more with all my workouts planned for the weekend. THANK YOU TONE IT UP! 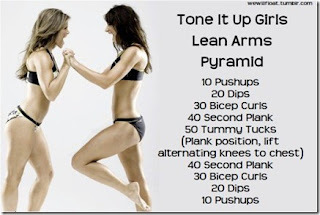 Todays Toned in '12 Challenge is to do 30 lunges every hour.. I tweeted/facebooked/emailed and texted this to a bunch of people and so far I have completed 90 lunges. By the time 5 pm rolls around and I am heading home for the weekend I will have done 240 lunges...AT WORK. How awesome is that?! For those of you reading this on Saturday OR do not want to do this at work, do the challenge today!! Set your phone to go off every hour and do those lunges, no matter where you are, take five minutes out of 60 and get that heart rate up!